We created a property sales advert design which provides maximum flexibility for the team at Macmillan, enabling them to produce bespoke adverts on a weekly basis. In order to support the brand development completed for the Macmillan Partnership we created a selection of property advertising templates to be used across a range of regional newspapers. In order to do so we worked closely with external new agencies to ensure we provided the best solution for Macmillan within the typical constraints of such a wide range of media. 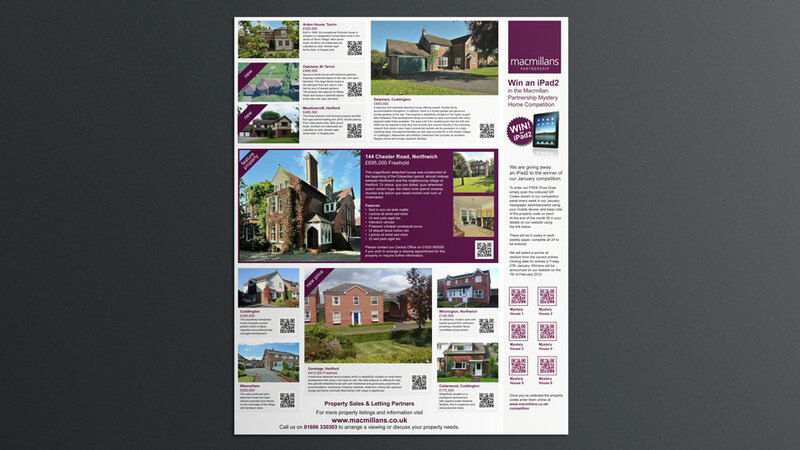 The templates provide maximum flexibility for the client, enabling them to produce their own bespoke property advertising on a weekly basis using a choice of gridded frameworks most fitted to the properties available at the time. Having successfully developed Castle Tile Centre's corporate brand style across their product brochure and stationery, we were asked to create some designs for a magazine advertising campaign for Cheshire Life. We were asked to create a suite of property specification brochures to suitably represent the quality of properties and service on offer by the business. Baker Wynne & Wilson tasked us with the job of creating an ad concept which would highlight their continued success in selling and letting properties in the Mid Cheshire area, and clearly display the reasons behind this success in a bid to raise awareness and increase customer enquiries.